Many clubs offer the facilities to develop or practice aspects of the short game such as chipping or putting, but when it comes to taking out one of your woods or a long iron to smooth out some of those niggling problems with your swing or attempting to develop the yardage of the long game, then driving ranges come into their own. The quality and quantity of such facilities has developed rapidly to satisfy the increasing popularity of the sport. It seems that not only are more and more people playing, but they are becoming more competitive in terms of wanting to develop skill levels. There are those golfers who see little benefit in such ranges, believing the only practice they need is on the course itself, but these individuals are only deluding themselves. 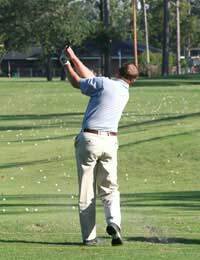 Spending an hour, two at the most, at a range offers the opportunity to repeat a shot as many times as you like, feeling the rhythm of the swing, and improving both technique and the aforementioned yardage because you are looser, i.e. there is not the pressure of the course tee where many players, particularly those playing in a group, often tighten to the detriment of the resulting stroke. Identifying the nearest range can be made by either using the local directory or an internet search engine, although you're local club may have such facilities available on site. Otherwise, as a starting point, why not consult the directory of ranges throughout the United Kingdom and Ireland that is provided by www.golflinks.co.uk or www.golfrangefinder.co.uk. In addition, many such facilities have their own websites, detailing location and what they offer. Even those with a high opinion of their own game will benefit if the range boasts its own pro; similarly mums or dads can introduce juniors to the game by booking tuition. For those not yet equipped, club hire is another service provided by a great many such ranges. Covered floodlit bays are often a standard feature, along with late-night sessions, providing the opportunity to practice whatever the weather and outside working hours. Facing out from the bay, in many cases greens marking, for example, 75 or 100 yards form part of the target area so that longer and shorter shots can be practiced in the same session and that the golfer doesn't suffer from the mental fatigue that would result from a feeling of simply hitting successive balls into a void. On the subject of balls, the volume that any one player can hit during a single session means they are provided at most ranges by the basket-load for around £2.50, although prices and the quantity per basket vary from facility to facility. Whatever the facilities at your local range, getting the most out of a session means setting yourself specific goals that can be translated onto the fairway. In this way, the driving range becomes less a necessary chore and more an effective tool in the development of an individual's technical ability.